Scripture and other wisdom literature remind us to be grateful; to be thankful. Gratitude is one of the core values of every religious tradition. 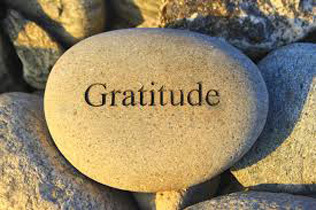 We even have medical evidence that adopting gratitude as a life practice is good for our health. If it’s so good for body and soul, why is it so difficult to do? We came up with a few reasons: (1) We are just so darn busy, programmed with tasks and worries, that we don’t feel like we can take “time out” – even for a minute. (2) Complaining is contagious and when we are around complaining people, it’s hard to be grateful. We need to extricate ourselves from whine-fests. (3) We really are ungrateful, or acting that way – but most likely we are unhappy rather than ungrateful. Try breaking a seemingly insurmountable problem down into manageable pieces and likely there is room for gratitude. (4) We get complacent. Everything is going well for us. Besides, we work so hard and deserve all this goodness we have. Try reclaiming the awesomeness of the universe. It’s not all about you! (5) We have been spared true disaster and loss in life, and the accompanying experience of just being grateful for life, breath, a small keepsake, and those we love. Remember to begin and end each day with a grateful heart.